At Angels Landscape & Suburban Sidewalks we are so proud of our TEAM of terrific people. They are the reason our company has continued to succeed. We work hard to hire the best and create opportunities for people who want to learn. It’s a family-like environment, where we care for each other and also strongly depend on one another to achieve success. As an employer, we depend greatly on our people. Our teams are the heart, soul, and face of the company. We continually work to provide substantial and innovative ways to support and recognize their tireless efforts. We are always looking for talented, passionate and dedicated people. We hire individuals who fit right in with our line of values—integrity, commitment, and a strong work ethic. 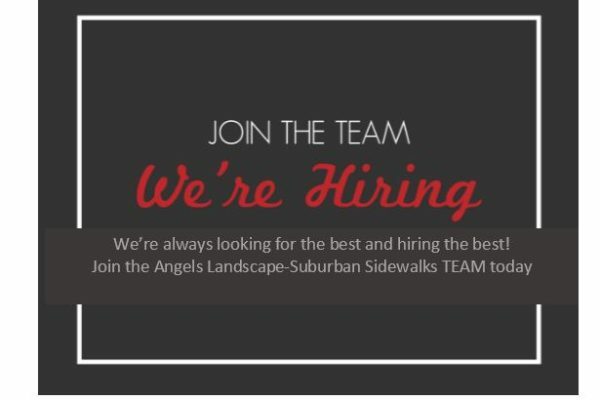 If you are ready to commit to a company that can provide you growth, opportunity, and long-term stability, Angels Landscape & Suburban Sidewalks would like to hear from you.